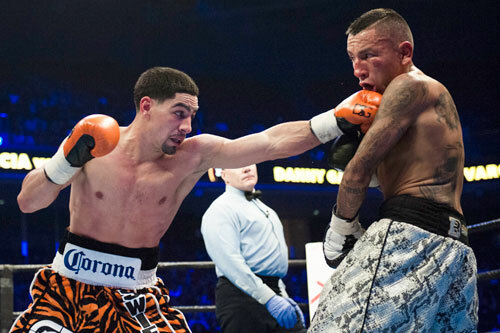 WBC welterweight champion Danny Garcia, 33-0, 19 KOs, warmed up for his anticipated March showdown with WBA champ Keith Thurman by knocking out a game Samuel Vargas, 25-3-1, 13 KOs, in a scheduled 10-round non-title bout at the Liacouras Center in North Philadelphia on Saturday night. Fighting for the first time in his hometown since 2010, Garcia completely controlled the action, dropping Vargas in the second round and finally stopping him in round seven before a large and animated North Philly crowd. 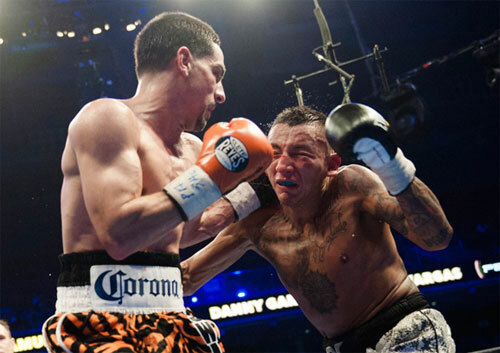 Garcia began landing bombs early in the bout and before long his left hook was jarring Vargas. Danny kept pressing and in round two landed a long, looping right hand that put Vargas on the canvas and threatened to end the bout on the spot. However, Vargas got to his feet and the bell ending round two prevented Garcia from closing the show. 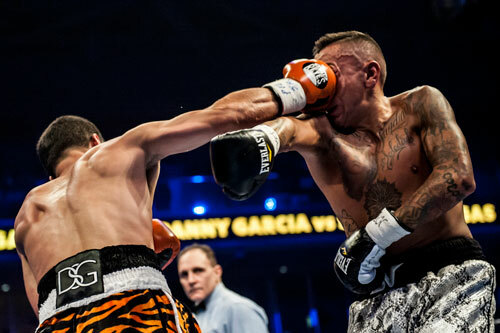 As Garcia continued to dish out the punishment in round three, Vargas remained gutsy and was determined to walk through the storm in hopes of turning the bout in his favor. But as the clock ticked, Garcia loosened up and his punches had greater and greater effect on Vargas. The Canadian kept his guard low and was wide open for Garcia’s right. So Danny threw that right often, piling up points and chipping away at Vargas’ strength. 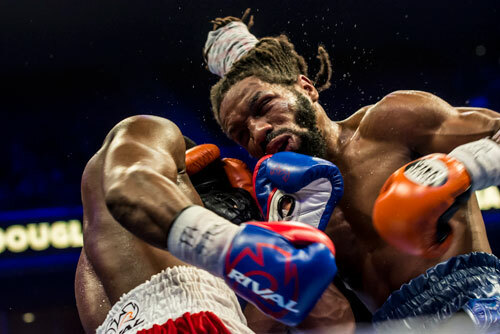 Garcia hurt Vargas in rounds four and five and by the sixth round, the Philadelphian’s right hands and left hooks just could not miss their target. Finally in round seven, Garcia staggered Vargas with a right and then unleashed an extended series of blows that gave referee Gary Rosado little choice but to stop the fight. The time of the stoppage came at 2:17 of round seven. Vargas was a willing warrior, but Garcia was simply fighting at a different level than the game underdog. Leading up to Saturday’s bout, much of the focus of the fans and the media was fixed on the planned future meeting between Garcia and Thurman, who was at ringside doing television commentary for the fight. 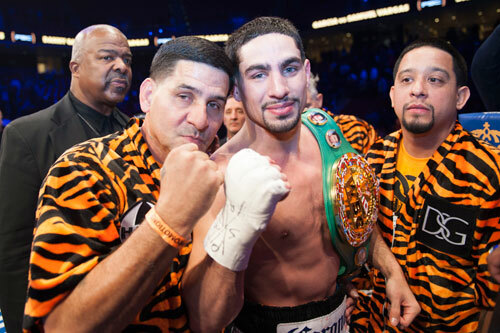 So it didn’t take long for the promotion of Garcia-Thurman to begin after Danny’s 33rd victory. The moment the ring announcer did his job declaring Garcia the winner over Vargas, Danny jumped through the ropes and taunted Thurman from the ring apron. The two exchanged harsh words while the fans ate it up. Garcia vs. Vargas was televised live by Spike TV as part of the PBC series. 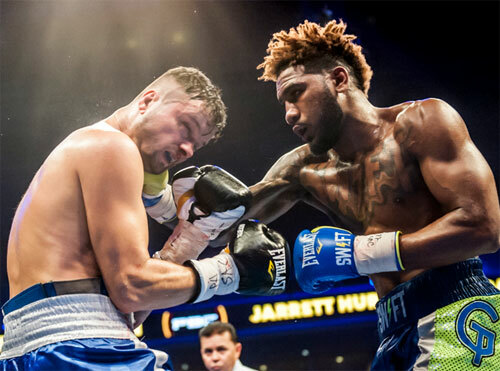 In another nationally televised bout scheduled for ten rounds, Maryland’s Jarrett Hurd, 19-0, 13 KOs, scored a technical knockout of Canadian JoJo Dan, 35-4, 18 KOs, in the sixth round of their junior middleweight fight. Hurd and Dan traded rounds early in the bout, but eventually the undefeated prospect pulled ahead and began rattling Dan with his punches. Slowly the energy sapped from the Canadian and Hurd went for the kill. However, Dan remained upright and Hurd’s attempts for the knockout produced no knockdowns. Hurd pressed ahead in a workmanlike fashion and just kept punching. As Dan tired, Hurd’s punches began snapping his head back. Eventually, without any major occurrence, Dan’s corner jumped in to ask referee Benji Esteves Jr. to stop the fight. Esteves complied and ended the bout at the 1:08 mark of round six. 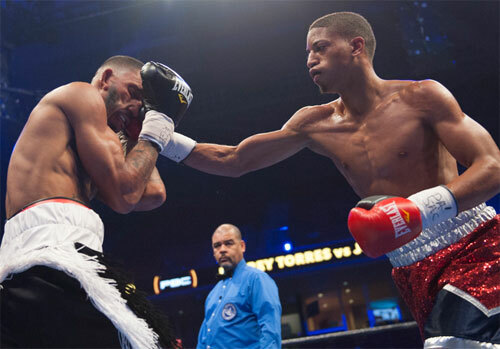 In an attractive junior lightweight 10-rounder, former WBA champion Javier Fortuna, 31-1-1, 22 KOs, survived a first round knockdown en route to winning a unanimous decision over previously undefeated Omar Douglas, 17-1, 12 KOs. The fight was also part of the Spike TV telecast. Fortuna stared quickly and immediately began landing substantial punches to Omar’s relatively untested head. Fortuna represented a big step up for Douglas, and early in the round it appeared Fortuna might be too much for the rising fighter from Wilmington, DE. 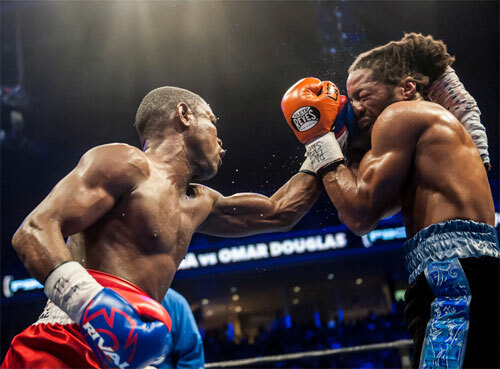 However, as the round wound down, and the fighters brawled in a corner, Douglas nailed Fortuna with a left hook that splayed the former champ on the canvas. Suddenly, the fight had turned sharply. Fortuna survived the scare and beginning in round two a pattern emerged that would carry Javier to victory. For most of the remaining minutes of the fight, Fortuna kept moving, stayed out of the corners and punched consistently. Douglas chased his foe, but never again caught him with a punch as damaging as that first round left hook. However, the specter of that punch hung in the air and offered a hint of drama as the boxers engaged, round after round. They continued to fight, but Fortuna stayed in control and built what seemed like an insurmountable lead on the cards. The final round was a free-swinging session with both fighters offering much offense. Then Fortuna hurt Omar and closed the show. All three official judges scored the fight for Fortuna. Dewey LaRosa had it the closest at 95-94. Tom Schreck and Anthony Lundy both scored it 96-93. My card was one point wider, 97-93, for Fortuna. 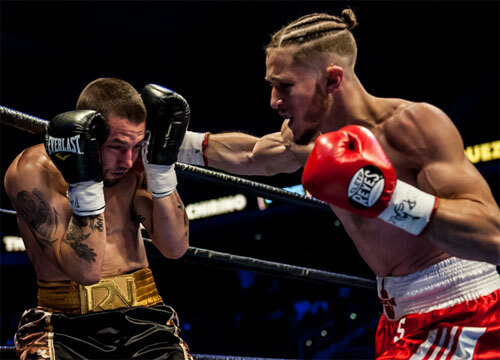 The fight was a good learning experience for Douglas, and perhaps set up Fortuna for a rematch with Jason Sosa, the man who took his title in June. 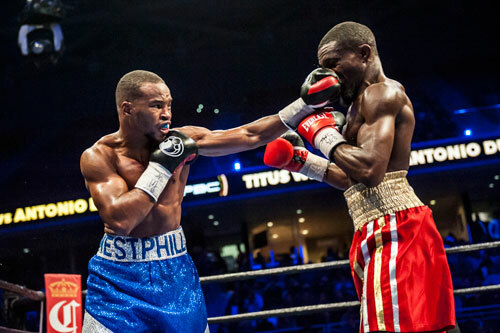 In a 6-round junior lightweight bout, Titus Williams, 7-0, 2 KOs, won an unpopular majority decision over Antonio Dubose, 8-2-1, 2 KOs. Dubose was the aggressor in the two-way battle, and held the edge on my card, 58-56. However, the official judges turned in tallies of 57-57 even, and 58-56 & 59-55 for Williams. The decision drew loud boos from the crowd. 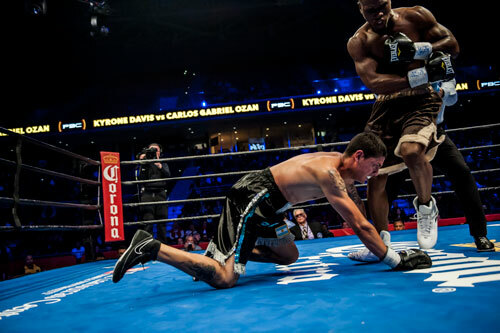 Delaware middleweight Kyrone Davis, 11-1, 5 KOs, rebounded from his first professional defeat with an impressive third round TKO of Carlos Gabriel Ozan, 12-2, 4 KOs, of Argentina. Davis looked sharp in the first two rounds, scoring what appeared to be a knockdown (but was called a push) in the first and dominating the second before finally lowering the boom in round three. In the third, Davis hurt Ozan with a left hook and then unloaded his arsenal until the Argentine hit the canvas. As Ozan fell, Davis kept landing serious punches during the trip. After the knockdown, Ozan got up, but stumbled backward into a neutral corner, prompting referee Benji Esteves Jr. to call a halt at 41 seconds of the third. 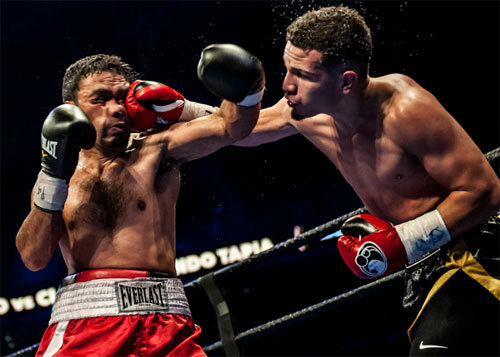 Philadelphia’s Milton Santiago extended his undefeated streak to 16-0, 3 KOs, with a clear cut 8-round unanimous decision over Argentine Claudio Rosendo Tapia, 28-17-4, 13 KOs. Santiago landed flush many times, but Tapia stayed on his feet until the final bell. Santiago won by three scores of 80-72. Junior lightweight Thomas Velasquez, 6-0, 4 KOs, won a shutout decision over Raul Chirino, 7-4, 3 KOs, in their 4-round preliminary bout. All scores were 40-36. In the opening bout of the evening, lightweight Jeffery Torres, 2-0, 1 KO, spoiled the pro debut of Joseph Serrano, 0-1. 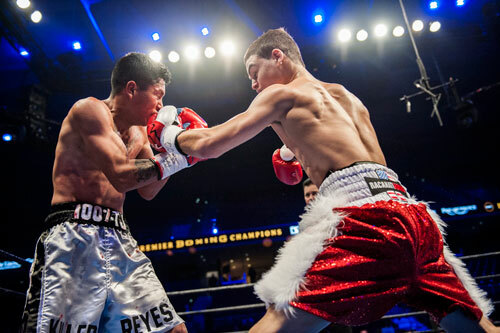 The heavy-handed Torres scored consistently throughout the bout and hurt Serrano in the first and fourth rounds on his way to 4-round unanimous decision. The scores were 40-34 and 40-36 twice. In the walkout bout after the main event, bantamweight Christian Carto, 4-0, 4 KOs, extended his knockout streak against Leonardo Reyes, 4-11, 1 KO, with a TKO in round two of their scheduled 4-rounder. Carto savaged his opponent's body for the better part of two rounds before dropping him with a hard right hand to the head. Reyes got up, but Carto pursued him and kept up the pressure. After Carto landed an array of shots to the head and body, referee Benji Esteves Jr. waved it off and stopped the last fight of the night at 2:34 of the second round. This boxing card, promoted by Kings Promotions and DSG Promotions, was Philadelphia’s biggest show of the year, with approximately 3,500 fans in attendance.